We are delighted to announce a new and exclusive holiday experience for 2018, sleeping up to eight people in a beautifully restored farmhouse on the stunning Affeton Castle estate, situated within easy reach of the M5 Junction 17 (Tiverton), Exmoor and Dartmoor. It has a hard tennis court, swimming pool, trout fishing and adjoining stables available for those wishing to bring horses and ponies. All bedrooms have private bathrooms or showers. 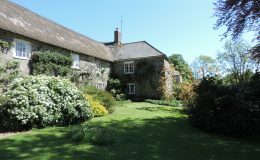 Affeton Barton is a wonderful base from which to explore Devon. The historic cathedral city of Exeter is about 20 miles away, 45 minutes drive in the car or a short journey by train from nearby Lapford or Eggesford stations. Barnstaple (30 minutes) and the stunning north Devon beaches (45 minutes – 1 hour) are a similar distance. The Plough Theatre and Arts Centre, RHS Rosemoor gardens and Dartington Crystal, at Torrington, are 30 – 40 minutes away. Nowhere is very far but none of the roads are very big! The area is wonderful for walking and bicycling as there is very little traffic in the lanes but some of the hills are steep. For those who wish to bicycle on the flat, the Tarka Trail is a wonderful asset for North Devon with many miles of estuary views and a flat tarmac surface. Excellent golf courses – Saunton and The Royal North Devon – are within easy reach, with a 9 hole course at Chulmleigh . Many pubs and excellent restaurants are close by. The farmhouse has just been restored and is now a comfortable holiday home sleeping 6 in three bedrooms, with the option of another double room to accommodate 8 people in total. All the bedrooms can either be twin bedded or made into superking beds. The master bedroom, overlooking the garden and the Castle, has an ensuite bathroom with a shower over the bath, w.c and washbasin. The Blue Bedroom overlooks the stable yard with its own bathroom a few yards away with a shower over the bath, w.c and washbasin. Bedroom three looks out towards the farmyard and has an ensuite shower room with w.c. and washbasin. A fourth double bedroom with ensuite bathroom is also available in order to accommodate 8 people. Kitchen The modernised, original farmhouse kitchen has a terracotta tiled floor with underfloor heating in winter. A two oven Aga stands in the huge fireplace with its original bakers oven. It is a real ‘cook’s kitchen’, well equipped with plenty of space. Fitted cupboards and a central island house an electric cooker, dishwasher and a fridge. Twelve people can sit around the two old pine kitchen tables; it is a great place to gather. The original, big farmhouse larder has now been divided into the former meat larder with a fridge/freezer and a utility and drying room. The big kitchen door leads into a covered area, outside loo and access to the garden and parking in the stable yard. There is also an old stable converted into an unsophisticated, alfresco dining area or a room for children’s activities in wet weather. Sitting Room The cosy and comfortable beamed sitting room is dominated by a huge fireplace with a woodburner and provides ample seating for 10 people. The wooden floor has underfloor heating in winter. The window looks into the pretty Castle gardens. There is a TV with DVD player, a bluetooth speaker and plenty of books. 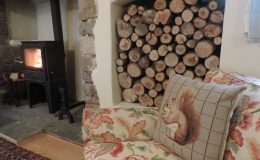 Logs are provided free of charge. Table Tennis Room A new pingpong table has proved extremely popular with all ages. All the rooms are furnished with antique furniture and designer fabrics, from Vanessa Arbuthnot, Colefax and Fowler and others. Entry into the house is either by the front door accessed by a cobbled path or into the kitchen from the stable yard. 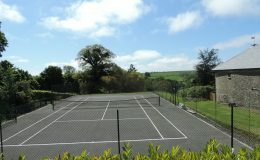 There is a large grassed garden and hard tennis court adjacent to the house. An unheated swimming pool is available to guests, shared with the owners on occasions. Guests are able to bring their own horses if they wish! With stabling for four it is the perfect place to ride and explore the beautiful countryside around or on Exmoor. Trout fishing on the Little Dart and roe deer stalking are available by prior arrangement. Stabling would be at an agreed extra cost with straw provided. Within a mile the pretty, completely unspoilt villages of East and West Worlington are delightful with their thatched cottages. St. Mary’s Church, West Worlington, with its twisted spire dates back to the 13thC. There are many footpaths and bridleways and the Two Moors way passes close to the Castle. The villages are extremely welcoming to visitors and there are many events throughout the year in the thatched Parish Hall including a monthly Brunch and the church fete in summer. The charming villages of Witheridge and Chulmleigh are nearby with small shops providing almost everything! 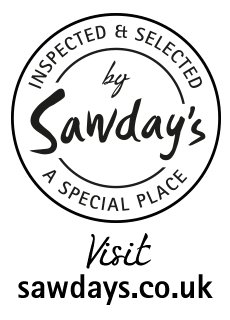 The nearby market town of South Molton is a wonderful place to shop with markets on Thursdays and Saturdays, excellent independent shops and a small Sainsburys supermarket stocking most things. Larger supermarkets are at Tiverton or Barnstaple. Visitors are recommended to fill up with petrol en route as our nearest petrol stations are at Lapford and South Molton.